Yes, I know it finished a couple of days ago, but I’ve been trying to get my head round being back at work. I am crying into a tiny white hanky as I write. Truly. The final event I was lucky enough to attend was Neil Gaiman and Margaret Atwood who chatted about their reading habits as children, the invention of the concept of genre fiction and why China now encourages science fiction conventions. 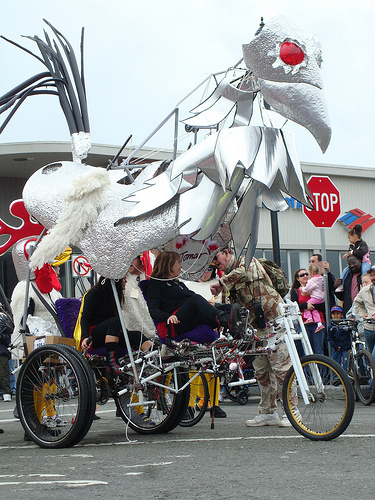 So why, you might be asking yourself, do I have a picture of a giant mechanical chicken in this blog? Glad you asked. The other event I attended but haven’t yet written about was the Kelpies Prize award for 2013, which was won by Alex Harris. In his book, mankind (or at least adultkind) has fallen, and the streets of Aberdeen are stalked by giant mechanical chickens…. Who could resist? I certainly can’t wait to read the finished book. You can find more details about the prize here. So now the yurt has gone for another year, and it’s back to teaching, editing the new teen novel and writing the new science book. Onward and upward.